through my hands: Recipe Monday - 'Pork' It's what's for dinner! Recipe Monday - 'Pork' It's what's for dinner! We have a Hawaiian restaurant in Portland that has the best Kalua pork. Mmmmm....just thinking of it makes my mouth water. I've been on a quest to see if I can reproduce it at home using my crock pot. This recipe is versatile because it is yummy coming right out of the crock pot. However, it is equally as good if you grill some onions, add in some teriyaki sauce, or even barbecue sauce. It is the dish that keeps on giving! I think the following recipe gives you that same succulent, slow roasted, smokey island-style pork flavor without all the work of actually digging a hole in the ground in your backyard. Not to mention trying to find banana leaves to wrap that pig in. Sylvia if you are reading this, please let me know if this comes close to your mom's yummy recipe. I didn't add the shredded cabbage you recommended this time, but I will definitely do it next time. You do need Hawaiian sea salt for this recipe and it is not readily available in our traditional grocery stores. I understand that Trader Joe's and Whole Foods carry it. I got mine at New Seasons. However, if you don't have any of these stores near you, you can order it off of Amazon. Safety note: There is a difference between a slow cooker and a crock pot. While I've seen recipes that advocate using a slow cooker for recipes like this, the manufacturer does not recommend it. Slow cookers cook at a really low heat and sit on a heating tray. They are not recommended for large cuts of meat like the recipe below. Now that we have that out of the way -- are you ready? Okay then, let's do it! Using forks, pierce the pork all over. Rub the Hawaiian salt all over the meat then follow up with rubbing the liquid smoke all over as well. Wash the outside of a banana, cut off a little of each end, slice down the center but "leave banana intact and inside of the peel." Place banana on top of meat. Pour 1 cup of water into crock pot. Cover and cook on LOW heat for 10 hours, turning once during cooking time. Remove banana and throw away. Remove meat from crock pot and place on plate to cool for 30 minutes. Remove broth from crock pot and place in heat safe container and place in freezer to cool. Pick off fat from cooled pork and put chunks of pork back into crock pot. Unconventional instructions here -- Using a handheld blender, slowly shred meat with blender blades. This works beautifully and takes 1 minute versus 15 using forks. Remove broth from freezer and skim off all fat from top. Optional: I like to strain the broth next but you don't have to. I use cheesecloth and pour the broth through it. Pour 1/2 to 1 cup of strained broth back into shredded meat to moisten. Now taste it! Get that smile off your face! Do you need more salt? If yes, add 1 teaspoon more or to taste of Hawaiian salt and stir meat. You can now turn crock pot back on low for 1/2 to 1 hour to warm it back up. Try not to let family see you sneaking bites. 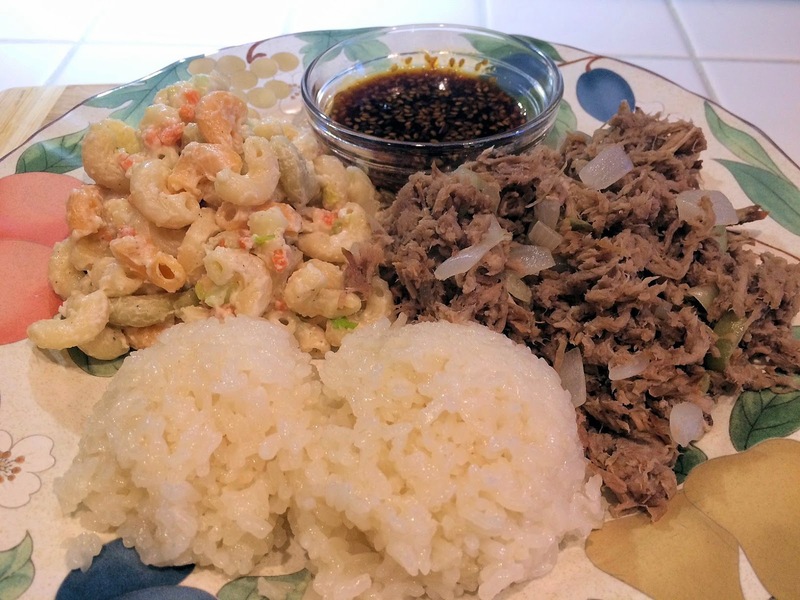 Add some sticky rice and a macaroni salad to your plate and you have a Daily Grind that will have your family singing you praises!